How cool is that? The funniest thing is I didn’t sell any of the ball ornaments, but the orders for Marios and Yoshis were coming in thick and fast…. 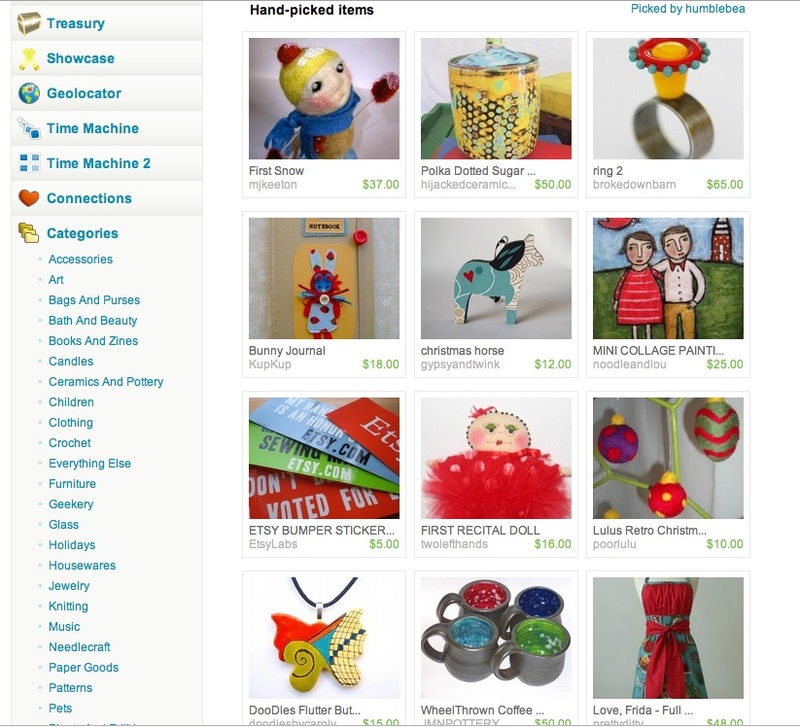 it was awesome, many thanks to Humblebee for selecting me for her front page treasury. 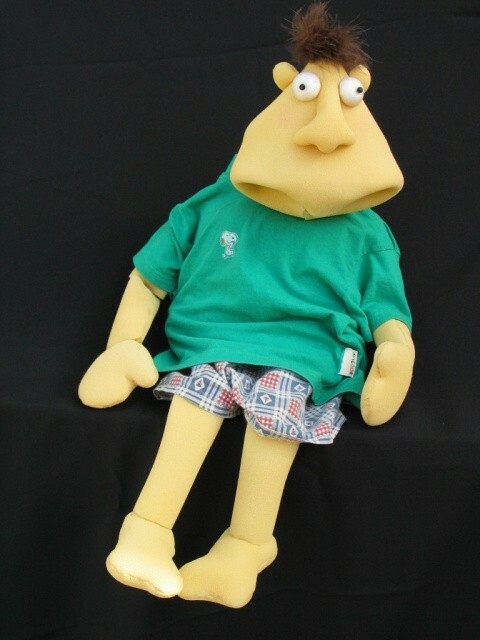 I was very pleased with how he turned out…….he was much triksier than I had anticipated so he was a brilliant challenge hopefully Sharona is impressed. 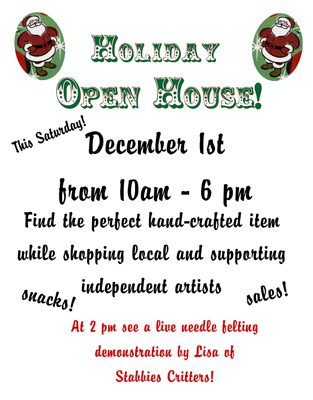 If you are in Madison on Saturday please stop by The Glitter Workshop 920 E. Johnson Street to see little ole me demonstrating the needle felting technique. I was thinking of making Christmas ornaments while you wait but really I could make things to order, if there was a demand for it……. Wow what a great weekend, I had such a fantastic time at the craftacular and can I just say what a well organised put together organised show it was. Big round of applause for Naomi of Glitterworkshop and Emily of EKRA they really couldn’t have done a better job…….they even got the show on the Madison morning news, which ensured a lot of people and when I say a lot I really mean a LOT of people and fantastically nice, warm people at that. I had a brilliant location beside another fantastic vendor Kittygrrlz. Her handspun yarn made me wish I could knit and she spun yarn (when she wasn’t busy) and it was truly mesmerising to watch. I bought a really cute Christmas ornament from Poor Lost Bread I loved her croissants with berets but the ornament was just too cute to not be mine. But it truly was a great show and all the vendors were fantastic and the booths were all lovely to behold. In other news some of my critters are featured over on Qdpatooties blog. Lisa (of Qdpatooties) did a fantastic job over the Thanksgiving holiday of doing a parade of toys by wonderful toy makers and it was a real honour to be included in it. If you have a moment to vote for me I would sure appreciate it. Oooohh it’s getting close and I’m all excited. I’ve been needlefelting like a demon since October and now I get to show off my work or let’s face it just show off hahaha. 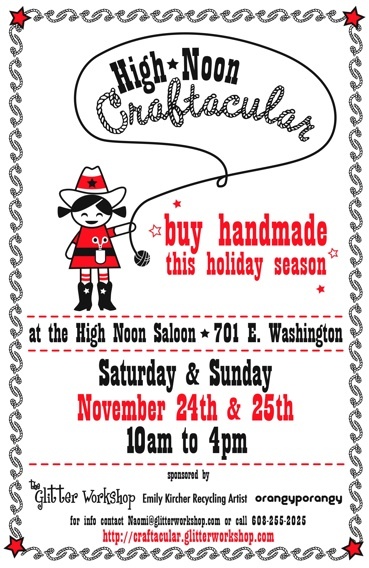 If you are in the Madison area this weekend I highly recommend that you check out this show, not just for me as there are some awesome crafters in attendance and the first 50 shoppers through the doors on Saturday get a goody bag comprising work from everyone at the show including yours truly. Mine is going absolutly brilliantly. Besides needlefelting like a crazy person to get ready for the craftacular in Madison on the 24th and 25th, I got a brilliant commission job this week. The rather fabulous raisinlike asked me to recreate in wool her Little Nick. Raisinlike whose real name is Sharona makes absolutely wonderful puppets and flutterbutt mobiles that I love and I am so incredibly flattered that she trusted me with this projected…. I couldn’t wait to get started on him so of course I thought I’d share my progress with you…….. So don’t be distressed as he has no legs yet……but they are coming along nicely. The “real” Nick wears little teddy bear slippers that will be fun when they are completed. In other news Santa didn’t win the softies central holiday competition, but he was incredibly honoured to have been nominated and he would like to thank all those that voted for him. I thought I’d share a work in progress with you today…….. If she looks a little grumpy that’s because she always is a little grumpy…you see Celeste is a house elf and boy does she hate her job. I’m not sure why she hates it so much…I mean it’s not as if she takes care of any of the cleaning or organising or well, anything useful in the home. Her favourite thing to do is to hide all the pens and pencils so that when you have that random thought or insightful flash you can never find one….it’s certainly won’t be found by the pad at the phone she is a professional afterall. The real reason for Celeste’s grumpiness is that she longs to be the Christmas fairy on the top of the tree at Rockerfeller center but this can never happen……you see Celeste is part water sprite and part Cornish pixie not exactly the required pedigree of the Christmas fairy ….but she excitedly fills in the application form every year, you know when the rejection letter arrived by all the cut strings on your teabags……..ah well maybe next year. I still have to finish a lot of detail on Celeste’s wings, face and feet……..but I’d just thought I’d share what I’ve been up to. 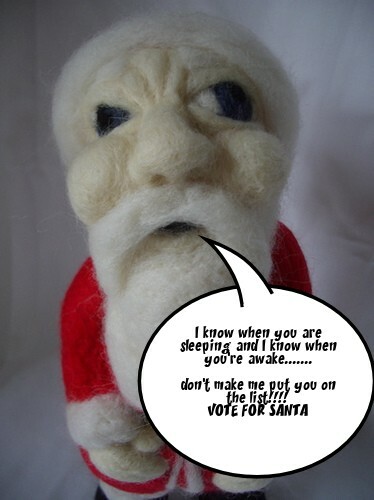 Please if you haven’t done so already vote for Santa at softies central. He’s muttering about needing lots of coal this year for all the naughty voters. Aaaaargh I’m so excited and I just can’t hide it…………..I’m one of the five finalists in the Softies Central Holiday Softy Awards….. But here is where I beg for your help……….please can you vote for me? pretty please with sugar on top……or chocolate if that helps. My Santa is in the deck the halls category which is about the 5th category in the questionaire and you will get to see some amazing softies……..so please, can you? Here’s the link just click on the voting site link when you get there. Or maybe just plain crazy…….who can tell. I made another Santa and I even put bells on him so he jingles when he moves. I know, I know I said I was done with Christmas stuff but apparently I can’t help myself. I think this is going to be longest run up to Christmas ever for me, I even have Christmas pies warming up in the oven right now, and that is so dangerous for me because if I start with all the Christmas food and treats in November then I will be as big as a house by January. You are currently browsing the Stabby Critters weblog archives for November, 2007.